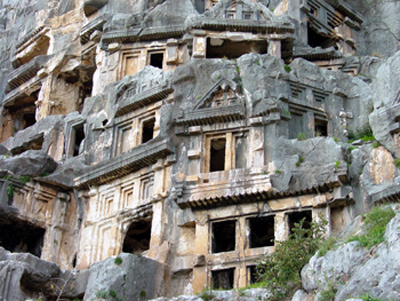 Hundreds of rock cut tombs and sarcophagi are located in the mountains and along the coast of Lycia. They are among some of the most unique features of this area. In this section we present a small selection of those tombs that are carved in the limestone cliff located just northwest of the theater at Myra. Most of the tombs in this section date to the fourth century B.C.